Since we are Dutch ourselves, we can’t miss out on the Dutch brands this year’s Baselworld. One of these brands is Christiaan van der Klaauw. 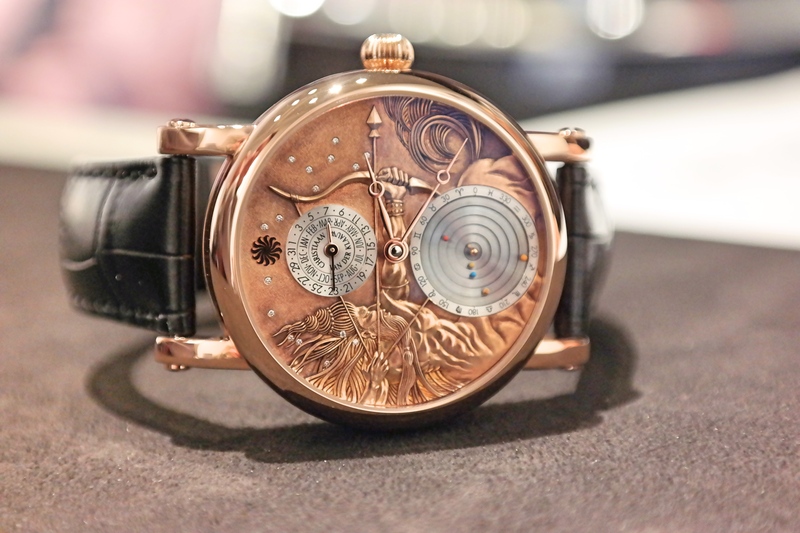 Famous for its astronomical complications, we paid them a visit at our first day and checked out their novelties. While waiting on Maria’s arrival, we took the time to listen to Daniel and his explanation on the three novelties they displayed. What immediately becomes clear is the fact that the brand this year focuses on creating art. The three new pieces on display each are very unique and artistic. Displaying craftsmanship on a very high level. First in line was the CVDK Real Moon Joure Horizon. A watch with the recognisable 3D moonphase, but with a different touch. This particular Real Moon Joure will be made 10 times and none of those will be the same. 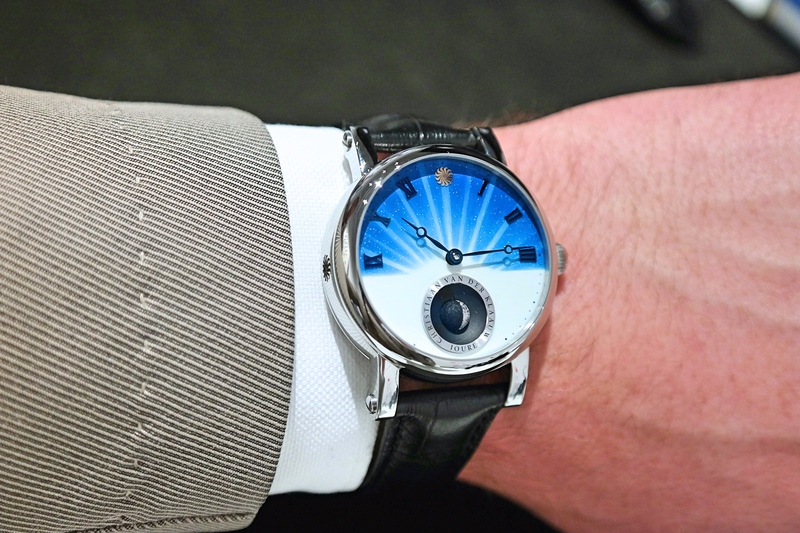 The dial comes with a hand-painted horizon pattern, made by Gaël Colon, that shows the sun peaking over the moon landscape. A creation that – as we discussed – fits perfectly into CVDK’s collection and leaves enough room for interpretation. What’s cool about this timepiece is the fact that – although there are a few copycats here and there – it caries the most accurate 3D moon-phase complication ever. Resulting in a deviation of merely one day in 11.000 years(!). The next one will be the CVDK Planetarium Zodiac Sign Sagittarius. Now this is really a remarkable piece of art. This piece unique has a very detailed engraved dial, made by master-engraver Kees Engelbarts. It fits in the CVDK zodiac signs collection, but we think it may be the most delicate and detailed piece up until now. The man displayed on the dial, the way he rises from the dial from the bottom up, his hairs – the details in this watch are really crazy. As we sat down with Maria to talk about it, it became very clear that the three of us totally agreed on our verdict. If you like the looks or not, the amount of detail and work that has been put into this dial deserves a huge portion of respect. 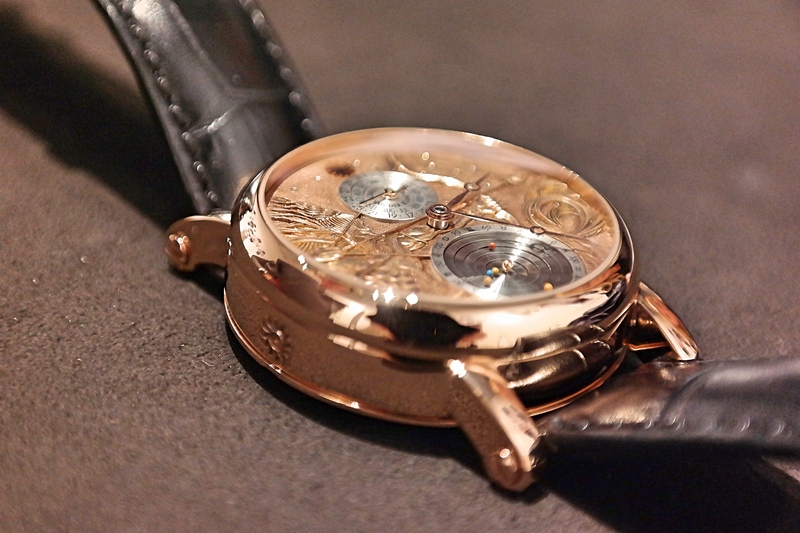 This is no longer merely a timepiece, it is really a piece of art. 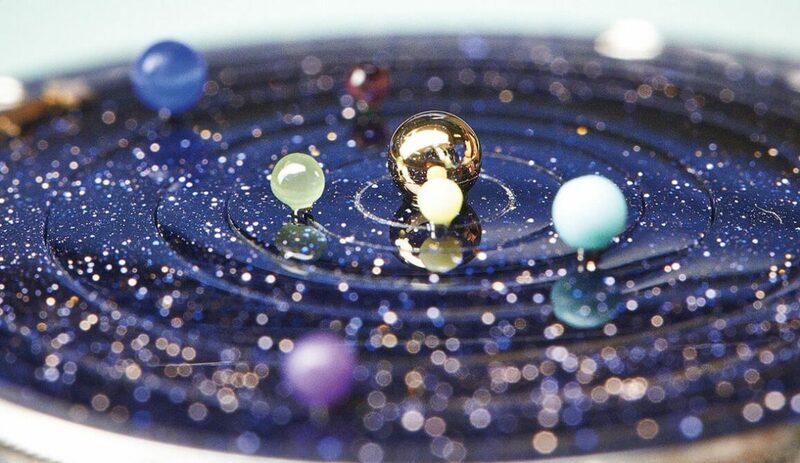 Another characteristic of this watch is the world’s smallest planetarium. A cool complication and yet another aspect that underlines why CVDK is the world’s leader in astronomical watch making. 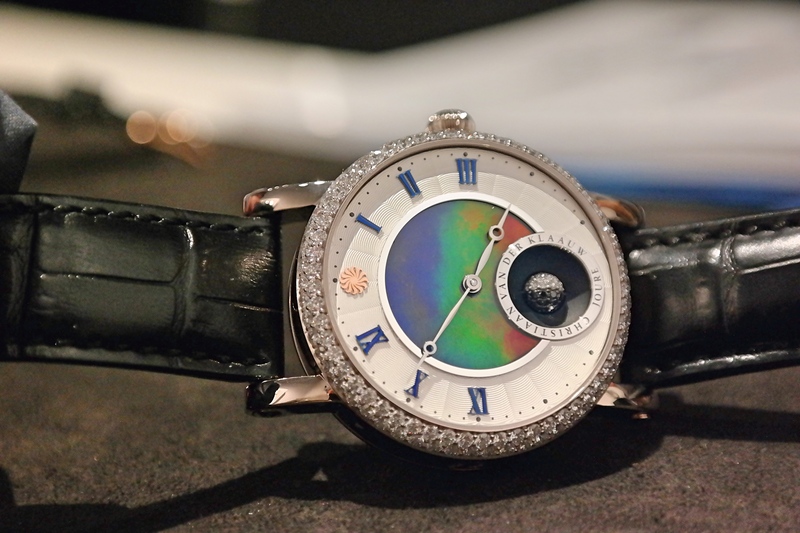 Last of the three novelties on display this Baselworld, is the CVDK Real Moon Stella Nebula. A beautiful real moon creation made in collaboration with Stella Polare from Tokyo, Japan. 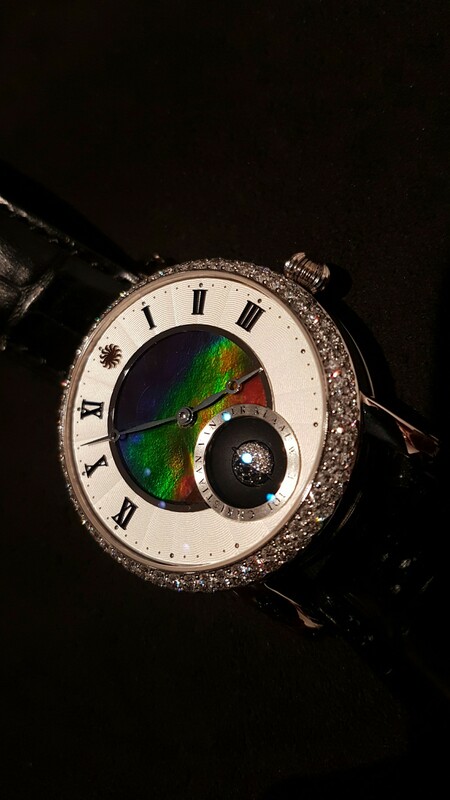 In the centre of the dial, above the 3D moon-phase complication, you’ll find an inner dial made of Ammolite. Ammolite is classified as a true gem and only 3 of these are determined real Ammolite in the last 300 years. A very rare piece of stone with a great diversity in colours. The Stella Nebula carries the same 3D moon-phase as the Real Moon Joure Horizon does. We can agree on the fact that the unique approach used in these three watches, generates a timepiece that’s officially classified as art. Why? Well, each timepiece, no matter what edition, is unique. Which clearly means that you will never bump into anyone that wears the same watch. As the Zodiac Sagarittarius is definitely a once in a lifetime, the other two also are specials because their custom made dials can never ever be identical. It’s impossible, due to natural processes or products. What we said earlier on perfectly explains what we think. It doesn’t matter if you like the timepieces or not, if it’s your taste or not, what’s clear is that they are unique. Unique because of craftsmanship that goes beyond simply pressing a button. That’s exactly why we adore these three timepieces. We would still like them if they weren’t Dutch. Absolutely true. Creating masterpieces of Art is what they do and quite frankly, we are very proud of such an achievement coming from Dutch soil. Super article, thank you so much! Thanks for the kind words Maria, it was great talking about these creations with you!